The March issue of the Bulletin has been published and is available. 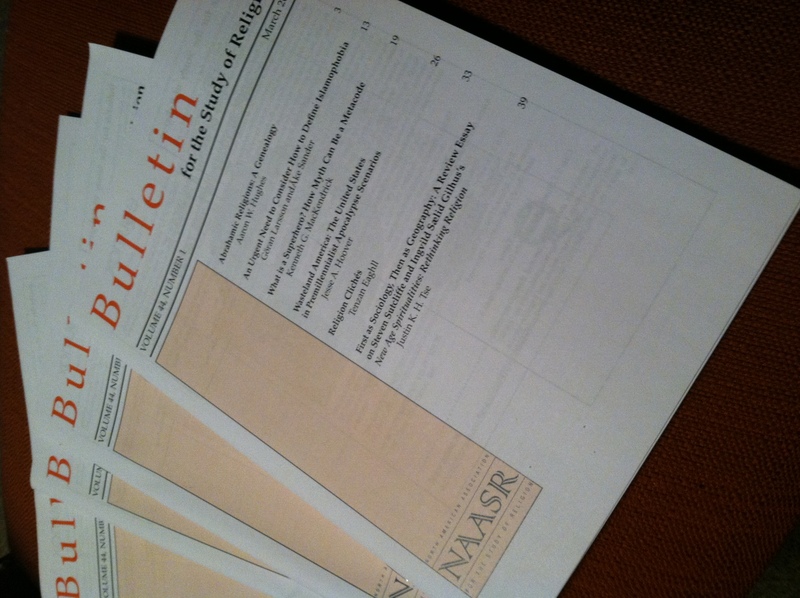 Below is the table of contents of this issue, which includes an eclectic set of articles offering a genealogy of “Abrahamic religions” (Hughes), a theoretical assessment of Islamophobia (Larsson and Sander), an application of myth-as-metacode to popular culture (MacKendrick), and a look at apocalyptic discourse in modern America (Hoover). In addition, this issue includes a look at a new set of clichés that undergird the field of religious studies (Eaghll) and a review essay of Sutcliffe and Gilhus’s New Age Spiritualities (Tse). This entry was posted in Announcements, Kenneth G. MacKendrick, Politics and Religion, Reflections on Islamic Studies, Religion and Popular Culture, Religion and Society, Religion and Theory, Theory and Method and tagged Aaron Hughes, Abrahamic religions, Åke Sander, american religion, apocalyptic, Bulletin for the Study of Religion, Christianity, genealogy, geography, Göran Larsson, Ingvild Saelid Gilhus, Islam, Islamophobia, Jesse A. Hoover, Judaism, Justin K. H. Tse, metacode, Myth, New Age Spiritualities, Religion, religious studies, review essay, scholarship, sociology, Steven Sutcliffe, superheroes. Bookmark the permalink.